Click to listen to episode (4:35). Except as otherwise noted, all Web addresses mentioned were functional as of 11-9-18. From the Cumberland Gap to the Atlantic Ocean, this is Virginia Water Radio for the week of November 12, 2018. This week, in the latest of a series of annual episodes in honor of Veterans Day on November 11, we focus on the U.S. Marine Corps. We start with audio excerpts from two Marine Corps videos: the first, from opening ceremonies for Marine Week in Detroit, Michigan, in September 2017; and the second, from an April 2012 interview in Quantico, Va., with Rosemary Woitowicz, whose son William was a Marine sergeant killed in Afghanistan in June 2011. VOICES - ~50 sec – 1) excerpt from opening ceremony of Marine Week in Detroit, Michigan, September 6, 2017; 2) excerpt from an interview on April 28, 2012, with Rosemary Woitowicz, the mother of Sgt. William J. Woitowicz, during a ceremony in Quantico, Va., posthumously honoring Sgt. Woitowicz, who was killed in Afghanistan on June 7, 2011. The Marine Corps began on November 10, 1775, formed by a resolution of the Second Continental Congress. That Revolutionary War resolution called for raising two battalions of marines to accompany the first ships of the colonies’ navy, which the Continental Congress had established only a month earlier. After the Revolutionary War, the new United States formally reestablished the U.S. Marine Corps in 1798. Today over 180,000 active-duty Marines along with Reservists perform roles on land, in the air, and on the seas, ranging from combat to embassy security to humanitarian missions and disaster relief. Marine facilities in Virginia include the Joint Marine and Army Base Myer-Henderson in Arlington; Marine Corps Base Quantico along the Potomac River and Quantico Creek in Prince William County; and the Marine Corps Air Facility at Quantico. Thanks to Marine Corps veterans and current personnel everywhere for their service and sacrifices, past, present, and future. We close with about 30 seconds of music, first from “The Marines Hymn,” and second from “Semper Fidelis,” the official march of the Marines, composed by John Phillip Sousa in 1888; both are played here by the U.S. Marine Band. *“Silver Star—Sgt. William J. Woitowicz/Interview with mother Rosemary Woitowicz,” April 28, 2012, in Quantico, Va. (2 min./15 sec. ), online at https://www.dvidshub.net/video/142843/silver-star-sgt-william-j-woitowicz-moms-interview. “The Marines Hymn,” by the U.S. Marine Band, was accessed online at https://www.marineband.marines.mil/About/Library-and-Archives/The-Marines-Hymn/, 11/7/18. “Semper Fidelis,” by the U.S. Marine Band, was accessed online at https://www.marineband.marines.mil/Audio-Resources/The-Complete-Marches-of-John-Philip-Sousa/Semper-Fidelis-March/, 11/9/18. 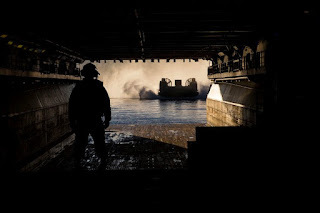 A U.S. Marine ramp marshal guiding a landing craft into USS Iwo Jima at Trondheim, Norway, on November 9, 2018, as part of NATO exercises. Public domain photo by Marine Lance Cpl. Margaret Gale, accessed online at https://www.marines.mil/Photos.aspx?igphoto=2002061903, 11/12/18. 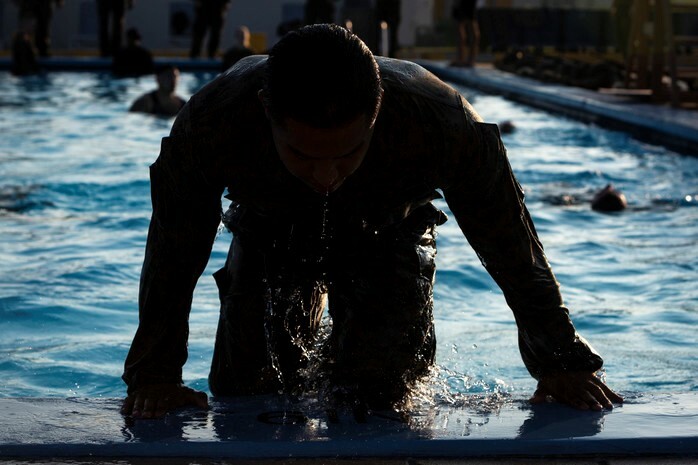 A U.S. Marine during Water Survival Training on Camp Foster, Okinawa, Japan, November 7, 2018. Public domain photo by Marine Lance Cpl. 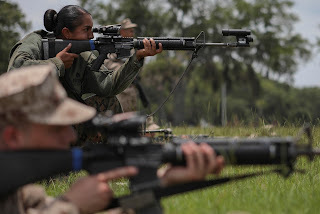 Krysten Gomez, accessed online at https://www.marines.mil/Photos/igphoto/2002060951/, 11/12/18. A U.S. Marine marksmanship instructor (center) during firearms training on Parris Island, S.C., June 6, 2018. Public domain photo by Marine Sgt. Dana Beesley, accessed online at https://www.marines.mil/Photos/igphoto/2001948140, 11/12/18. A U.S. Marine aircraft mechanic performing maintenance on an F-35 Lightning II during exercises among the Marines, Air Force, and Navy at Camp Douglas in Wisconsin on August 13, 2018. Public domain photo by Marine Sgt. David Bickel, accessed online at https://www.marines.mil/Photos/igphoto/2001953986/, 11/12/18. EXTRA FACTS ABOUT U.S. MARINE BASE QUANTICO IN PRINCE WILLIAM COUNTY, VA.
Excerpted from U.S. Marine Corps Base Quantico, “History,” online at https://www.quantico.marines.mil/About/History/. “[During the Revolutionary War], American, British, and French armies used nearby roads to quickly move from one battlefield to another. During the Civil War, Confederate cannons blockaded Union traffic on the Potomac from the banks of the Quantico area. By the 1880s, the land Quantico resides on had been acquired by speculators, who would sell it to the Corps in 1917. “The Commandant of the Marine Corps established Marine Barracks Quantico on May 14, 1917. Thousands would be trained in Quantico during World War I…. In 1920, Marine Corps Schools was founded…. “In 1947, Quantico Marines conceived of carrying troops from ship-to-shore by helicopter and formed a special squadron to test the idea: Marine Helicopter Squadron-1, commonly referred to now as HMX-1. …More recently, Quantico played a large part in the development of vertical and/or short take-off and landing (or V/STOL) aircraft and amphibious assault ships. Quantico’s small, but vital, air facility and HMX-1 continue to aid in development, training, and education, as well as their most visible duty, support of the U.S. president. “On Jan. 1, 1968, the base was re-designated the Marine Corps Development and Education Command (MCDEC). … On Nov. 10, 1987, the Marine Corps transitioned the Development and Education Command into the Marine Corps Combat Development Command (MCCDC), cementing Quantico’s central role in developing concepts, plans, doctrine, training and equipment for the 21st-century Marine Corps…. “The 1990s were a time of great growth for Quantico. The Marine Corps Research, Development and Acquisition Command, the precursor to today’s Marine Corps Systems Command, began moving to Quantico in 1990. A decade later, MCSC moved to its current location on historic Hospital Point. “In 1995, the base became home to…the Marine Corps Warfighting Laboratory. The lab’s mission is to conduct experimentation in 21st-century warfare…. “…The Department of Defense established the Joint Non-Lethal Weapons Directorate in 1997 to provide the military with greater flexibility in dealing with the challenges of Military Operations Other Than War. “With so many diverse yet intricately-woven units, it is appropriate that Quantico is called the Crossroads of the Marine Corps. …On Oct. 1, 2015, Marine Corps Base (MCB) Quantico was designated Marine Corps Installations Command-National Capital Region - Marine Corps Base Quantico (MCINCR-MCB Quantico). Collin Hoeferlin, “Marines in the Revolutionary War: Defending America Since Day One,” July 10, 2013, online at https://marineparents.com/marinecorps/revolutionary-war-marines.asp. Council on Foreign Relations, “Demographics of the U.S. Military,” April 24, 2018, online at https://www.cfr.org/article/demographics-us-military. Defense Visual Information Distribution System, “Media Advisory: MARSOC Marine receives Silver Star (posthumous),” 4/28/12, online at https://www.dvidshub.net/news/87675/media-advisory-marsoc-marine-receives-silver-star-posthumous. Military.com, “Marine Corps History: The Early Years,” online at https://www.military.com/marine-corps-birthday/marine-corps-history-early-years.html. Military Bases.com, “Military Bases in Virginia,” online at http://militarybases.com/virginia/. U.S. Department of Defense, “Today’s Military/Marine Corps,” online at https://www.todaysmilitary.com/joining/marine-corps. U.S. Department of Veterans Affairs, “Veterans Day,” online at https://www.va.gov/opa/vetsday/. U.S. Marine Band, main Web page at https://www.marineband.marines.mil/; “History of the Marines’ Hymn,” online at https://www.marineband.marines.mil/About/Library-and-Archives/The-Marines-Hymn/; and “Semper Fidelis,” online at https://www.marineband.marines.mil/Audio-Resources/The-Complete-Marches-of-John-Philip-Sousa/Semper-Fidelis-March/. U.S. Marine Corps, main Web page at https://www.marines.mil/; “Marine Corps 101,” online (as PDF) at https://www.marines.mil/Portals/59/Docs/MarineCorps101_2.pdf; “Marine Corps Embassy Security Group,” online at https://www.mcesg.marines.mil/; and “Who We Are: Mission of the Marine Corps,” online at https://www.marines.com/who-we-are/our-purpose.html. U.S. Marine Corps Base Quantico, online at https://www.quantico.marines.mil/. U.S. Navy/Naval History and Heritage Command, “Origins of the U.S. Navy,” online at https://www.history.navy.mil/content/history/nhhc/browse-by-topic/heritage/origins-of-the-navy.html. U.S Air Force, online at https://www.airforce.com/. U.S. Army, online at https://www.army.mil/. U.S. Coast Guard, online at https://www.uscg.mil/. U.S. Department of Defense/Historical Office, online at https://history.defense.gov/. U.S. Navy, online at https://www.navy.mil/. U.S. Navy, “Hampton Roads [Va.] Naval Museum,” online at http://www.history.navy.mil/museums/hrnm/index.html. All Water Radio episodes are listed by category at the Index link above (http://www.virginiawaterradio.org/p/index.html). See particularly the “Community/Organizations” subject category. Following are links to previous Veterans Day episodes on U.S. branches of military service. All five branches – Episode 187, 11/11/13. Air Force – Episode 341, 11/7/16. Army – Episode 394, 11/13/17. Coast Guard – Episode 239, 11/10/14. Navy – Episode 289, 11/9/15. 2.5 – why U.S. citizens celebrate major holidays, including Veterans Day. VS.9 – how national events affected Virginia and its citizens. USII.8 – economic, social, and political transformation of the United States and the world after World War II, , including role of U.S. military. VUS.13 – U.S. foreign policy since World War II, including the role of the military. GOVT. 12 – role of the United States in a changing world, including responsibilities of the national government for foreign policy and national security.